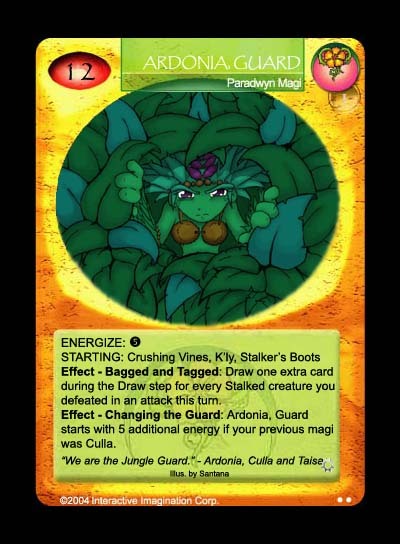 Ardonia, Guard is another alternate magi in the set, and like all Paradwyn cards in the set she has a Stalking theme. The lower starting energy might seem to make it worse on first glance, but if Culla was the previous magi, she starts with more energy than her original version. Starting with Crushing Vines and Stalker's Boots doesn't hurt either, enabling her to stalk on the get-go. The art is a customised piece by Eric Santana and I must say one of his best in the set.